No, Bobby's Girl is not a lost Leslie Gore recording. 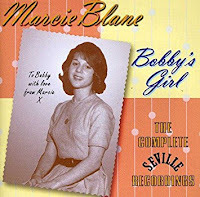 Marcie Blane scored a top five hit in 1962 with Bobby's Girl. It turned out to be her only hit though a couple of other songs charted. You can get all her recordings on this budget comp. She was born Marcia Blank May 21, 1944 in Brooklyn, NY. Her father Ernest Blank was a pianist and music teacher. Marcie grew up on Long Island. She was in the high school band at Jamaica High. Bobby's Girl was written by Gary Klein and Hank Hoffman. Klein has had a long career in the music business. Hoffman asked Marcie to record some demos for him. Seville Records A&R man Marv Holtzman liked Marcie's voice and he signed her. Bobby's Girl was the first single and it reached #3 on the Billboard Hot 100. It was arranged and the orchestra was led by veteran session guitarist Billy Mure. So now she's a pop star. In England, Bobby's Girl was a hit for Susan Maughan. Klein and Hoffman wrote and produced similar songs for Marcie. But they were unable to score a second big hit. Marcie continued to record for a couple of years. She also studied music at Queens College. But she quit the music business after her contract ended in 1965. Marcie got married, had two kids and became a teacher. In a 1988 interview, Marcie said she loved music but she hated the music business. Now she appreciates her success but back then she was miserable. Here's a video for Bobby's Girl by Marcie Blane. Thanks to Spectropop for the Marcie Blane info.